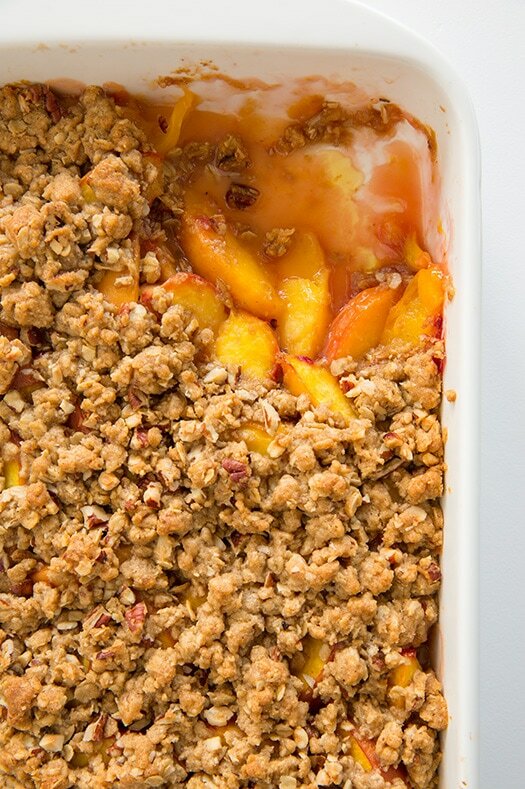 It’s true, this is no doubt the best peach crisp I’ve ever had! I’m completely in love with it! I couldn’t stop reaching for just one more bite, and then another, and oh just one last little one. Take a look at all these layers and tell me how you could resist? 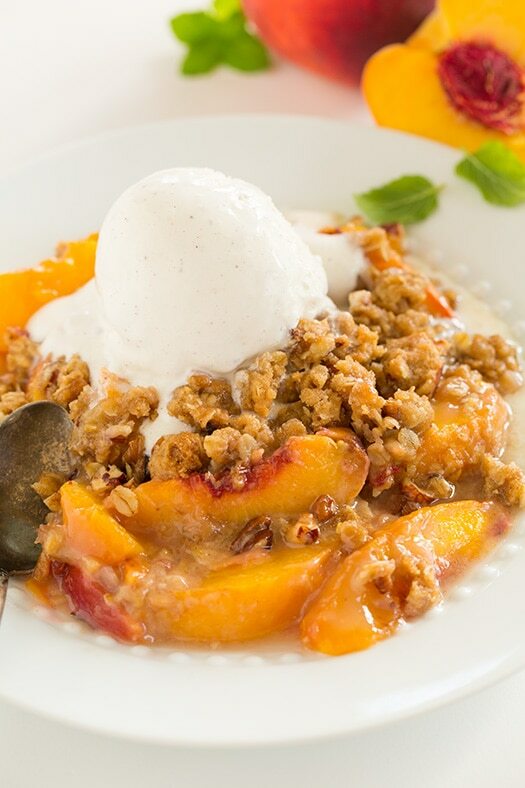 You get this deliciously sweet and juicy peach layer topped with the most irresistible crisp topping in the world, and after its baked you top it off with a spoonful of vanilla ice cream (so just think peaches and cream), yes it’s just wow good! I made this crisp to be what I’d consider the perfect amount of everything. Just the right amount of brown sugary sweetness, some texture from the oats along with a good balance coming from an equal part flour (so it’s not too oat-y, plus it helps hold the crumble together). It’s enhanced with just the right amount of spices (I don’t want to distract from the delicious flavor of the fresh fruit), plus it has a perfect buttery flavor, and the crunch from the nuts just takes this over the top. You’ve gotta try this recipe! You just do :). 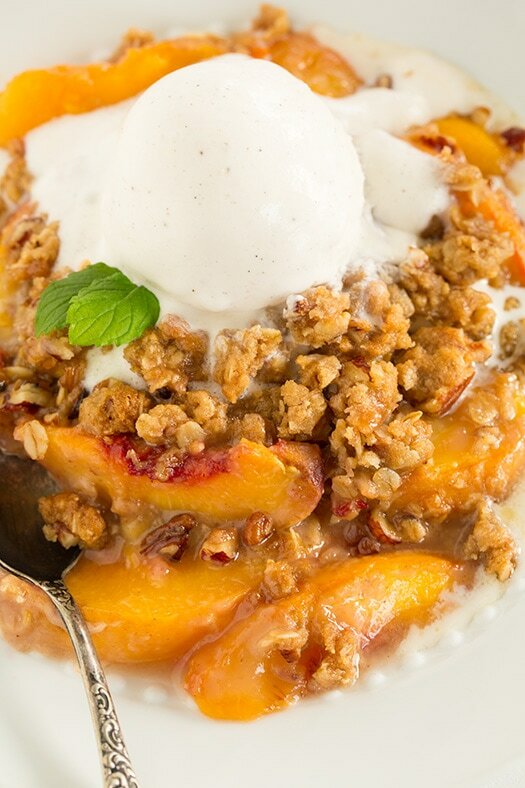 The only peach crisp recipe you'll ever need! 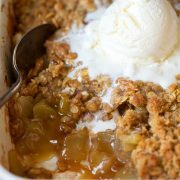 It's made with sweet juicy peach filling and finished with a delicious, buttery cinnamon crumble. Preheat oven to 350 degrees. 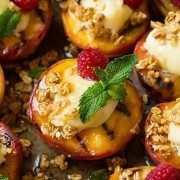 In a large mixing bowl toss peaches with lemon juice. Sprinkle granulated sugar and flour over top and toss to evenly coat. Pour mixture into a buttered 3 quart baking dish (mine was 12 x 8 x 2 1/2) and set aside. In a mixing bowl, whisk together flour, oats, salt, cinnamon, nutmeg and ginger. Add brown sugar and stir, while using fingertips to break up any clumps. Add butter to mixture and using fingertips, rub into mixture until it comes together in small clumps and pieces of butter a no longer visible. Mix in nuts, tossing several times (so it sticks to the crumble). Sprinkle mixture evenly over top of peaches in baking dish. Bake in preheated oven about 38 - 42 minutes until topping is golden brown and juices are bubbling along edges. Serve warm with ice cream or sweetened whipped cream if desired.